From a commercial perspective, SATCOM is used for critical national infrastructure services such as communications, financial and banking services, power grid operation, security, healthcare, transportation, disaster relief, and essential distribution systems for food, water, medicine, fuel and vital products. 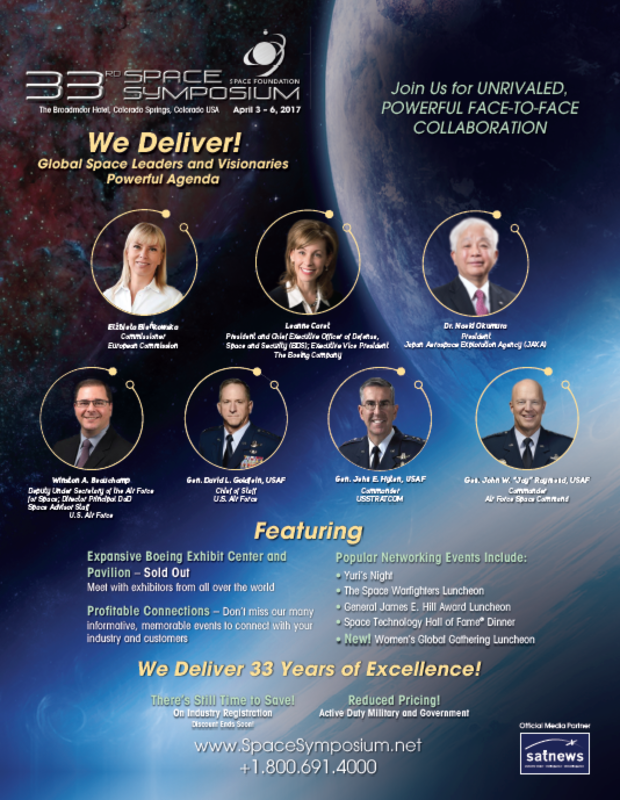 From a DoD perspective, SATCOM is indispensable to command, control, reconnaissance, relief and warfare communications. As SPAWAR PMW/A 170 asserts, “Bandwidth is THE Key enabler of Information Dominance.” For the US Navy in particular, SATCOM is the mainstay of long distance communications in peacetime, for humanitarian operations and especially when on wartime footings. SATCOM demand is ever increasing in response to unprecedented international data requirements from the human, military and financial sectors. 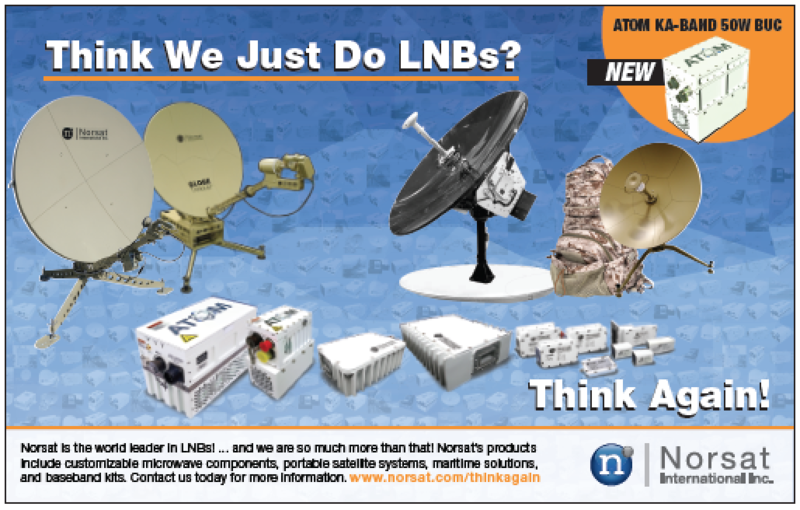 This extraordinary demand is driving a convergence of commercial and DoD SATCOM requirements. The US Navy is experiencing steep SATCOM bandwidth growth. Even as new satellites come online, their bandwidth is immediately consumed, with requirements continuing to outrun bandwidth availability. Among many results, this leads to increasing utilization of commercial satellites to carry encrypted Navy communications within Commercial Broadband Satellite Program (CBSP) capabilities. Commercially, SATCOM bandwidth use doubles every two to three years. In commercial space, this growth generates revenues that can, in part, accrue to new satellite development and launch. Even so, staying ahead of the SATCOM bandwidth demand curve is a daunting task. In addition to deploying more satellites to meet growing bandwidth needs, the SATCOM market is also vigorously pursuing increased bandwidth utilization efficiencies as well as capabilities which support dynamic reallocation of available bandwidth. The rapid evolution and deployment of High Throughput Satellites (HTS) will supply additional available bandwidth, and requires budget availability to conduct needed R&D, construction, launch and upkeep operations. Additionally, advanced modem technologies leveraging concepts from Adaptive Coding and Modulation (ACM) techniques, wide band frequency hopping, direct sequence spread spectrum and other bandwidth-sharing and interference-resistant technologies will be important. 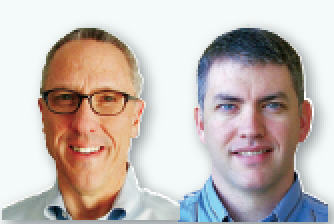 As bandwidth becomes more available, the planning process for satellite, transponder and frequency procurements, authorizations and assignments must also keep pace with military and business needs. However, SATCOM planning isn’t consistent or shared across the commercial and DoD space, can employ antiquated manual techniques and tools, involves numerous people in the control loop, and is often error-prone. In peacetime, current planning processes for requesting SATCOM access can be time-consuming, non-agile and frustrating. Additionally, the process of reporting interference events or other outages into SATCOM planning operations is often manual, incomplete and overly burdensome for both the SATCOM user and the planner. Automated SATCOM planning and re-planning systems operating at electronic speeds, quickly adapting to dynamic bandwidth availability, smartly avoiding interference, and automatically adjusting equipment and settings at both ends of the SATCOM link must be developed and deployed. These systems will greatly facilitate operations in degraded environments, will provide badly needed fail-over capabilities, are a key to success with rapidly expanding VSAT systems and related interference protection, and may themselves deter many forms of intentional interference. “Protected Communications” is a general phrase representing actions taken beyond the normal SATCOM transmission to reliably transmit and receive signals. Protected SATCOM extends well beyond typical approaches related to increasing the overall link budget (e.g. larger apertures, more power, changing modulation types, etc.). For the DoD, Protected MILSATCOM is often implemented by an EHF service with small-footprint SATCOM beams for strategic and tactical purposes. Strategically, Protected MILSATCOM must provide low probability of interception, detection and exploitation (LPI, LPD and LPE) and be survivable, to include anti-scintillation and anti-jam communications. Strategic Protected MILSATCOM must also provide robust command and control services in benign, contested and nuclear operational environments, as shown in Figure 1 below. Tactically, Protected MILSATCOM must provide anti-jam and LPI/LPD/LPE communications in both benign and contested environments. For the commercial segments, Protected Communications attempts to minimize the effects of interference in benign environments, though recent events also suggest the need for anti-jam capabilities. Generally, advanced systems, products and capabilities along the Protected Communications Continuum fall within a Protection Progression evolution as shown in Figure 2—Protection Progression for products, capabilities and advanced systems. From a threat sense perspective, users and systems must quickly know when something is wrong and when communications are being degraded or interrupted. For example, for RF signals, automatic signal monitoring with real-time interference detection, characterization and reporting is a desired approach. For networks, network health monitoring, cyber-attack sensors and virus detection are good approaches. Learn and Adapt tools provide insightful data trending and analysis that feeds understanding and automatic adaptation to the threat and risk occurring in the environment over time. Effective data logging and monitoring should store historical, time-tagged measurement data to support trending and analysis. Such a repository is useful for predicting equipment failures, communications outages, and impending electronic attack preceded by detectable signal trends and other indications. Historical data can also be exploited to differentiate equipment problems from operator error, and between accidental or intentional interference. Protect and Harden is the next line of protection, and includes solutions that protect against threats. 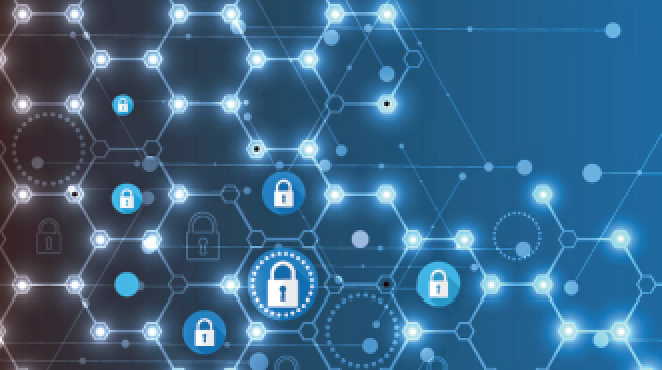 Signal geolocation capabilities fall within this classification, as do devices that protect against cyber-attack or network transmission issues. Fight Through capabilities utilize advanced signal processing, for example, to add robustness at the waveform level to enhance LPI/LPD/LPE. Wide band Frequency Hopping and Direct Sequence Spread Spectrum (DSSS) are typical methods to permit operation during active interference and jamming. Also from a fight-through perspective, the Protected Tactical Waveform (PTW) is a new approach using Frequency Hopping Spread Spectrum (FHSS) to provide enhanced anti-jam attributes. PTW combines features of the current MILSATCOM protected waveform and the commercial waveforms such as Digital Video Broadcasting (DVB.) This hybrid strategy strives to balance protection and affordability. RF link protection begins long before a satellite is launched or a ground station is designed. Channel Simulators, Transponder Simulators and Satellite Signal Emulators can generate nominal and worst-case SATCOM test signals within a controlled lab environment. Engineers can then design and tune their firmware, software and hardware for unimpeded communications even under degraded signal conditions. These instruments give SATCOM hardware, firmware and software designers a huge advantage during the design and test process, enabling them to develop and test equipment that will be tolerant of natural signal degradation and resilient to a broad variety of attacks on the signal. SATCOM gear should include embedded signal monitoring and interference cancellation/reduction capabilities. These functions must communicate with higher-level systems to provide overall RF situational awareness, and resilience. Figure 3: Advanced Spectrum Analysis with covert and overt interference detection and characterization capabilities. IP traffic between ground system components and sites must be fast and reliable. However, wide area IP networks exhibit traits that can degrade performance: dropped packets, indeterminate latency, variable jitter, and packet duplication and reordering. For most users, Transmission Control Protocol/Internet Protocol (TCP/IP) masks these problems and delivers data acceptably. But many mission critical applications cannot tolerate TCP/IP’s retransmit and acknowledge behavior when attempting to deliver consistent data at required rates. To repair dropped packets, Packet Forward Error Correction (PFEC) and Intelligent Retransmission Protocol (IRP) protocols should be utilized. Both protocols allow high throughput with low latency across lossy, long-haul links and give the user the flexibility to choose the best solution for each situation. Ground systems must provide extensive network performance analysis and diagnostics in addition to robust traffic protection. Automatic selection and fast switchover between geographically separated antennas should be available to ground stations. Enabled by advanced and very cost-effective RF over IP transport devices, such diversity compensates for SATCOM-impairing weather, interference or failure events. This capability also addresses equipment, manpower and security concerns. With well-designed and tested SATCOM systems enhanced for link protection, the first operational line of defense is continuous and advanced monitoring of the received and transmitted signals. 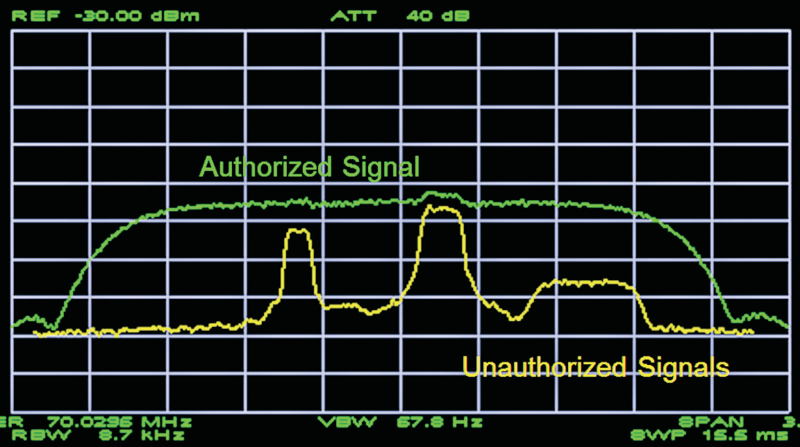 Automatic signal monitoring must go beyond simple spectrum analyzer mask analysis of bandwidth, center frequency and power level. In-depth and real-time signal analysis must also include blind determination of modulation type, data rate, coding scheme, MER, EVM and BER. External and embedded monitoring and analysis tools should mathematically decompose the signal of interest in real-time, and search for unauthorized signals within the protected bandwidth that could degrade QOS as shown in Figure 3. As well, these tools should measure signal parameters (e.g., modulation type, data rate, bandwidth, center frequency, BER, Es/No, etc. ), and automatically alert operators and systems of discrepancies from the Satellite Access Authorization (SAA), as well as detected interference. Protected SATCOM refers to a wide area of need with a broad set of existing and evolving solutions that leverage capabilities between DoD and Commercial applications. SATCOM is a vital infrastructure element in commercial, as well as military C2 and data transport applications. Due to their customer-critical and mission-critical nature, the function and performance of these SATCOM links must be protected with sharp focus and constancy. This article has summarized just some of the best practices that can be employed to assure mission success. 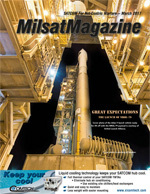 For more information, please see Best Practices for End-to-End Protected SATCOM in the June 2016 issue of MilsatMagazine. Steve Williams is the Business Area Manager of Test and Training Systems at RT Logic and may be reached at swilliams@rtlogic.com. Chris Badgett is the Business Area Manager of Mission Data Processing at RT Logic and may be reached at cbadgett@rtlogic.com.